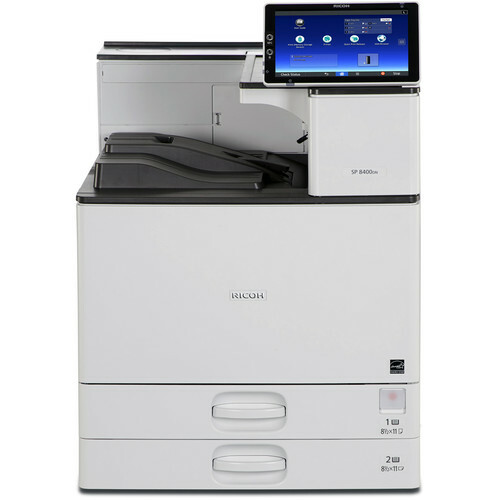 Maximum Print Size: 12 x 23.6"
Handle your high-volume needs with ease by using the SP 8400DN Monochrome Laser Printer from Ricoh in your office. Able to reach speeds of 60 ppm and produce the first print in just 2.2 seconds, this unit will ensure you never miss a deadline. Also, it has added versatility with an intuitive 10.1" touchscreen, a print resolution of up to 1200 x 1200 dpi, and automatic duplexing. Added functionality is provided by the use of two 550-sheet input trays and a 100-sheet bypass tray, allowing the use of multiple paper types and sizes simultaneously from 3.5 x 5.8" to 12 x 23.6" in size. Other benefits include a USB port and SD card slot for direct printing while USB 2.0 and Ethernet are available for connection to a computer or network. Using laser printing technology, the SP 8400DN can produce black-and-white documents at speeds up to 60 ppm. A max print resolution of 1200 x 1200 dpi ensures sharp, detailed documents. The printer will warm up in just 2.1 seconds and produce the first print in 2.2 seconds. It will also recover from sleep mode in 7 seconds. Automatic duplexing is standard for saving paper and producing double-sided documents. Standard media handling is provided by two 550-sheet input trays and one 100-sheet bypass tray. The standard trays can handle media sizes ranging from 3.55 x 5.83" to 11.69 x 17" in size while the bypass tray can work with paper from 3.55 x 5.83" to 12 x 23.6". Various paper types can be used, including plain, recycled, color, letterhead, card stock, bond, preprinted, and Com10 and C5 envelopes. Optional paper trays and organizers are available for expanding capacity and output. Standard printer features include Bonjour Support, Windows Active Directory Support, DDNS Support, PCL Resident Font Adoption, Tray-Parameter Change from Web Image Monitor, 1200 dpi Support, Universal Driver, XPS Support, WS Printer, Wireless LAN Interface Option, Media Direct Print (Print from USB/SD), Poster Print, and WPS Support. Utilities available include Device Manager NX Series, Web Image Monitor, and @Remote. A 10.1" Smart Operation Panel features touchscreen controls for intuitive operation over the printer and its settings. A USB 2.0 port and an SD card slot are available for directly printing from portable storage devices. It features a 1.46 GHz processor and 2 GB RAM for smooth, fast operation. An embedded browser allows access to cloud-based storage applications, such as Google Drive, Box, and Dropbox, or to directly download PDF documents. Standard connectivity includes USB 2.0 and Ethernet. Built-in font support includes 80 Roman fonts and 13 international fonts via PostScript 3, PDF, and PCL emulations. The SP 8400DN in ENERGY STAR qualified and EPEAT Gold certified and it has a Typical Electricity Consumption (TEC) rating of 2.6 kWh/week. Standard security features include DataOverwriteSecurity System (DOSS), Authentication (Windows/LDAP/Kerberos/Basic/User Code/802.1.x Wired), Wireless LAN Security (WPS/IEEE802.11i/IEEE802.11w), Encryption (Address Book/Authentication Password/SSL Communication/S/MIME/IPsec Communication/HDD/SMTP over SSL/TLS/Transport Layer Security/SSH/Wireless LAN), Locked Print, Network Protocols ON/OFF, IP Address Filtering, Quota Setting/Account Limit, Compulsory Security Stamp, Unauthorized Copy Prevention and Mask Type for Copying. Box Dimensions (LxWxH) 36.0 x 29.0 x 27.5"